This week appears to be brand week, as yesterday Avaya refreshed its look and feel, and today Cisco launched its new brand campaign out of its Partner Summit event. Cisco has had many brand campaigns over the years, with the most recent ones being “There’s Never Been A Better Time…” and “The Network. Intuitive.” The new brand message, “The Bridge to Possible” is unique in that it’s the first one that ties together all aspects of Cisco, including its technology, business, brand, people, and the company’s purpose. Between Europe’s oldest port and its most modern… there’s a bridge. 140,000 ships and 467 million tons of cargo move through the Port of Rotterdam annually. Cisco is being used to network and secure the entire port, which generates terabits of data. Between the Big Easy and a little peace of mind… there’s a bridge. The New Orleans Police Department relies on Cisco to network the city’s massive number of security cameras to provide real-time data analytics. This is particularly useful when 18 million people head to NOLA for Mardi Gras, as it can ensure the city remains its crazy, welcoming self while easing the workload of its officers. Between si and yes… there’s a bridge. The country of Uruguay understands that kids need to learn English to remain competitive in the global economy. Cisco collaboration tools are being used to bring qualified teachers into classrooms in 1,300 schools. Between poverty and prosperity -- Cisco is partnering with Global Citizen to connect people across the world to help eliminate poverty by 2030. For those not familiar with Global Citizen, the organization is a community of people that want to take action and are willing to provide support to causes that need help. Between scraping by and cultivating a new life -- Over 80% of the world’s poorest people are substance farmers that can produce enough extra food to escape poverty. Cisco is providing resources to Digital Green to fund the development of a mobile-enabled service to aggregate farmers’ produce, lowering costs and increasing productivity. Between data streams and drinkable water -- Clean drinking water is a luxury in many countries. Cisco is working with the Akvo Foundation, which uses crowd-sourced data to help communities understand the contaminants in their water and develop plans to ensure water is clean, potable, and healthy. Regarding its people, Cisco will be making more of a concerted effort to showcase the difference makers inside the company. For example, Alphonsine Imaniraguha currently works as a network consulting engineer in Cisco’s advanced services organization. She was once an orphaned refugee from Rwanda and used that experience to create the “Rising Above the Storms” non-profit organization that advocates for orphans in developing countries and empowers at-risk youth through education. The new brand isn’t just about business-, world-, and people-changing stories. Along with it, Cisco is simplifying its brand architecture to highlight its business value and deliver better customer clarity and competitive strength. One of the big initiatives is a simplification of the portfolio. Many Cisco products currently have long technical names such as “UCS 480 ML M5 Rack Server.” These names actually do mean something. For example, UCS = Unified Computing Server. The 4 in 480 indicates 4 RU, and I believe the 8 is for an 8 GPU system. ML stands for machine learning. The rest, I have no idea. M5 might mean model 5… or it’s named after the M5 AI unit from Star Trek. The point is, one needs to be able to decipher code to understand many Cisco product names. 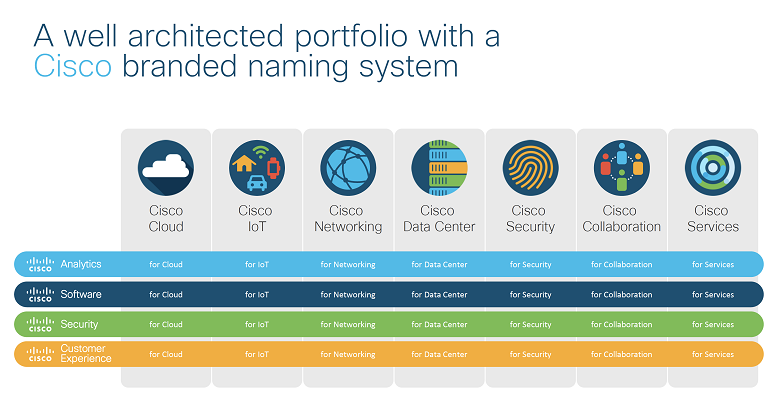 Cisco will be simplifying the portfolio and reducing the number of creative names from 165 to 16, the number of portfolio pillars from 13 to three, and the average pillars in a portfolio from six to four. The new naming convention is designed to be customer-focused rather than Cisco-centric, and this will make it easier for customers to buy products and for partner to sell them. This initiative includes better consistency of how analytics, software, security, and customer experience cuts across different product sets. The below graphic shows how this is structured. The revival of the bridge takes Cisco back to its roots, but the “Bridge to Possible” is forward-looking, in that it demonstrates what happens when smart, impassioned people are armed with innovative technology.